Tap the new message icon in the lower-right corner of the screen. The icon appears on all the Mail screens, so don’t worry if you’re not at the main Mailboxes screen. A screen like the one shown appears. Type the names or e-mail addresses of the recipients in the To field. Tap the microphone icon on the virtual keyboard to dictate the names or e-mail addresses of the recipients in the To field. 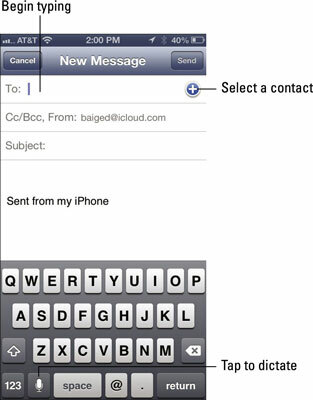 Tap the + button to the right of the To field to select a contact or contacts from your iPhone’s address book. You can rearrange names in the address field by dragging them around, moving, say, a name from the To field to the Cc field. Tap the field labeled Cc/Bcc, From. Doing so breaks the single field into separate Cc, Bcc, and From fields. The Cc label stands for carbon copy, and Bcc stands for blind carbon copy. Bcc enables you to include a recipient on the message that other recipients can’t see has been included. It’s great for those secret agent e-mails! Tap the respective Cc or Bcc field and type the name. Or tap the + symbol that appears in one of those fields to add a contact. If you start typing an e-mail address, e-mail addresses that match what you typed appear in a list, temporarily covering up the To, Cc, or Bcc field. If the correct one is in the list, tap it to use it. Tap the From field to send the message from any of your e-mail accounts on-the-fly. This step assumes that you have more than one account and want to send mail from an account different from the one already shown. The subject is optional, but it’s considered poor form to send an e-mail message without one. Type your message in the message area. The message area is immediately below the Subject field. Tap the Send button in the upper-right corner of the screen. Your message wings its way to its recipients almost immediately. If you aren’t in range of a Wi-Fi network or a cellular data network when you tap Send, the message is sent the next time you’re in range of one of these networks. Apple includes a bunch of landscape orientation keyboards for various apps, including Mail. When you rotate the phone to its side, you can compose a new message using a wider-format virtual keyboard.